The 2019 Kwid gets better safety tech, Apple Car Play, Android Auto and more at the same price. In August last year, Renault brought in a mild facelift of the Kwid. The higher variants of the model were fitted with a revised chrome finished grille. Other changes made during the time include a reversing camera, chrome treatment to the centre console, a 12v socket at the back and a rear central armrest. For the 2019 iteration though, the Kwid gets a few more updates. The compact car now has driver airbag, ABS, speed-sensing auto lock, reverse parking sensors and overspeeding alert as standard across all the variants. All this brings the Kwid in line with the new mandate that comes into effect starting 1st July, 2019. The addition of these safety features should help the Kwid perform better in the crash test results – previously, the car had scored an abysmal zero star in the Global NCAP tests. Renault has also added Android Auto and Apple CarPlay to the infotainment of the Kwid. Mechanically, the Kwid remains unchanged. It will continue to be sold with the same 0.8-litre and 1.0-litre engine options. While the former pushes out 53bhp/72Nm, the latter develops 67bhp/91Nm. The 1.0-litre petrol mill is on sale with a manual transmission as well as an AMT. 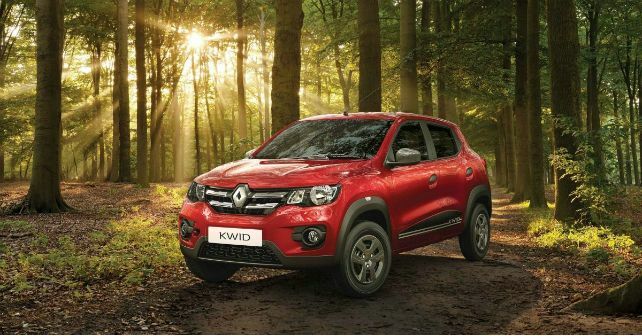 Renault hasn’t changed the prices of the Kwid despite the additional features. The Kwid starts at Rs 2.66 lakh for the base trim and demands Rs 4.63 lakh (ex-showroom Delhi).